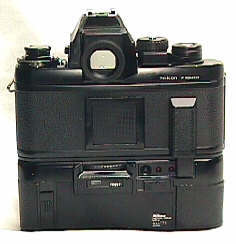 Comparison shot of F3P finder with original F3 prism finder. 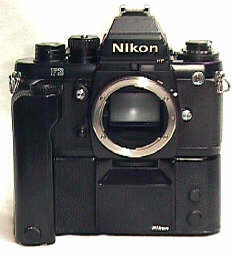 Note the large, solid, shutter release without cable release threading. 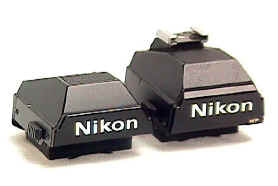 The shutter release is normally covered by a rubber cover, but it sometimes wears off with use, like this one. 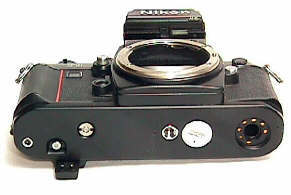 The F3P has a different, mechanical shutter lock from the standard F3. 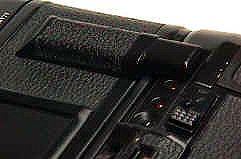 There is a projecting pin on the ring surrounding the shutter release (barely visible in photo). 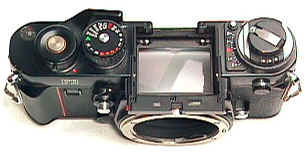 Push it in and rotate it to the right to lock the camera shutter release. Push it in and rotate it to the red dot position to release the lock. 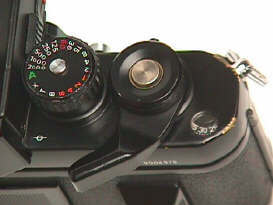 Notice the rubber seals around the edge of the F3P finder. 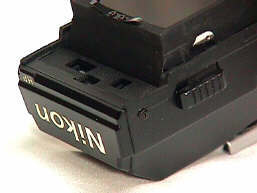 Close-up of MF6B back and blocked out self timer LED.